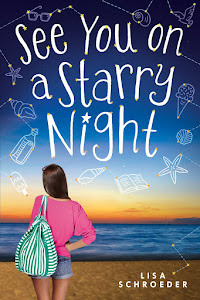 It's just a little over a month until my new YA novel is released! What's it about? 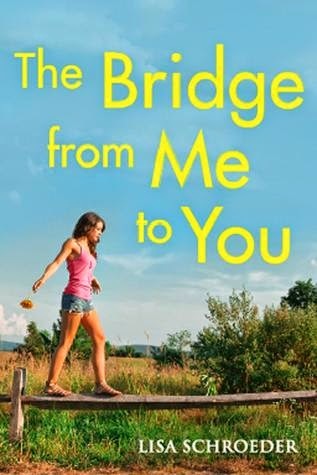 It's about small town life, about family and friendship, about dreams, about a boy named Colby who is burdened by his future and a girl named Lauren who is burdened by her past. It's gotten some good reviews already from Publisher's Weekly, School Library Journal, and Kirkus! This book is appropriate for people ages 12-92. Okay, maybe even 93. What I most want to tell you today is that one of my favorite blogs, Novel Novice, is doing a pre-order contest. I've signed 25 super cute bookplates with some artwork that totally goes with the book (you'll see when you read it), so the first 25 people to submit your receipt to Novel Novice will get a bookplate along with a bookmark. But that's not all! You'll also be entered into a drawing to win some amazing books Novel Novice is giving away. Many, many independent bookstores take pre-orders on-line. I've listed some of them below with DIRECT links to my book to make it really easy for you. Once you get an e-mail receipt for your order, you can forward that to the e-mail address given for the contest details - please CLINK ON THE LINK ABOVE to read how to officially enter the contest! If you don't see your favorite bookstore here, just look them up and I'm sure they'll be happy to take your pre-order. The Novel Novice page has links to other on-line retailers, too. I'm just trying to make sure you have lots of options. Please note if you are in the Portland-Metro area, I will be signing books at Powell's Cedar Hills Crossing on August 14th, and I would love to see you there! Every week I'm fortunate to get mail from readers, both handwritten letters that arrive in my post office box as well as e-mails that arrive in my inbox. 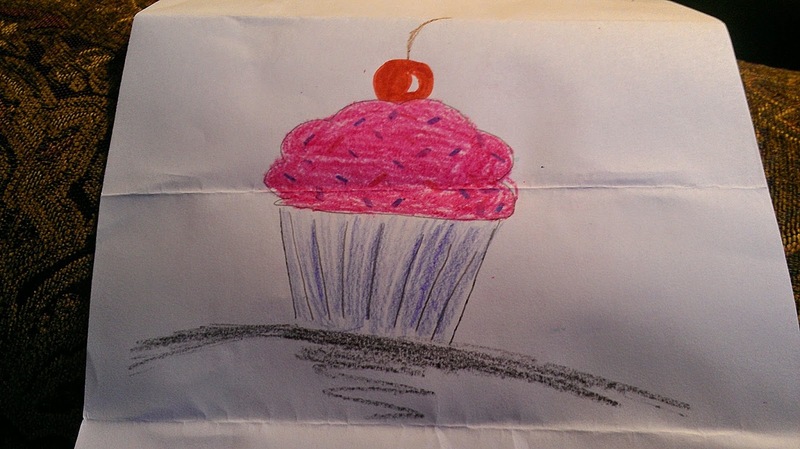 Sometimes the handwritten letters include artwork too, which I LOVE!! But all of the letters are awesome, really. Thank you for taking the time to write to me, dear readers!! "Hi, I just wanted to tell you how much you inspired me to read. 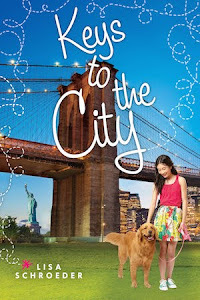 I had never read a book until my teacher introduced me to Chasing Brooklyn." ~ J. It's summer! Are you excited? I AM SO EXCITED!!! Read lots of books, okay? 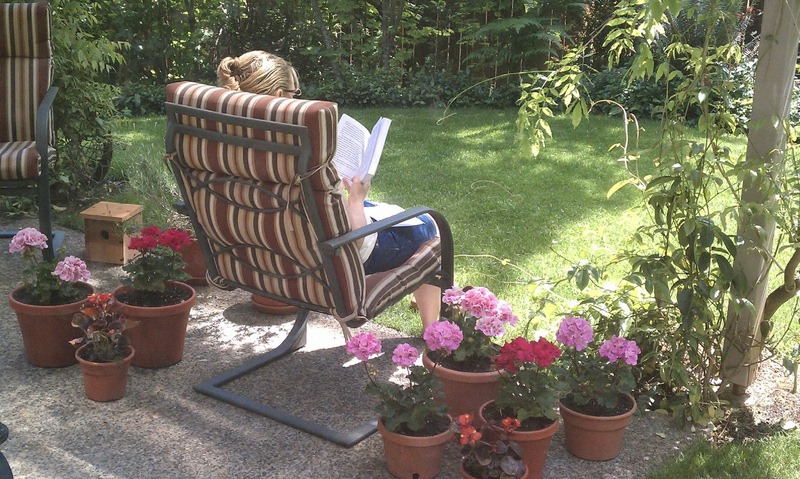 Because here's another quote from I Heart You, You Haunt Me: "Books and summertime go together. This past week, there was yet another article posted about YA lit that caused a lot of controversy. I didn't read the article, because I didn't want to add another click, but I gather that the gist was basically this: adults who read YA should be ashamed of themselves. Whatever. We've heard it before. When I saw people on twitter talking about it, I just rolled my eyes. Again. For approximately the fifty-second time. I proudly read YA, and MG too. It is rare for me to pick up a book written for adults, because they often bore me. (I did, however, finish THE STORIED LIFE OF A.J. FIKRY by Gabrielle Zevin recently and really enjoyed it). More and more adults are reading YA, and that's great! Just like we are allowed to pick what we watch on TV, decide what we put in our mouths, we, as adults, are also allowed to read whatever the heck we want. No shame, people. There are some authors that have huge legions of adult fans. Melina Marchetta comes to mind. Also, Maggie Stiefvater. A.S. King. Stephanie Perkins. Andrew Smith. Cassie Clare and Laini Taylor. Now, lots and lots of teens love their books too. But I know these names come up again and again by adults who read and love YA. The thing is, you will not find my name mentioned very often by adults who read YA. And I'm not saying that to get sympathy or whatever, it's just a fact. Are there some adults who enjoy my YA books? Sure. But not many, really. 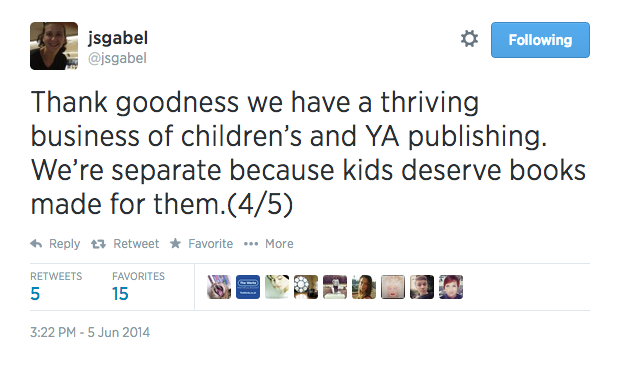 Yesterday on twitter, some YA authors were talking about how they don't write *for* teens, they write *about* teens. That anyone can read them and enjoy them, and I get what they're saying. I also feel like that is what the market wants right now - YA novels that are about teens but that anyone will read and enjoy. I'm not sure my books fit in with that notion, and it scares me a little bit. Because what I *don't* want to happen is for the teens to be forgotten in all of this. Editor Julie Strauss-Gabel tweeted something that I really liked yesterday. 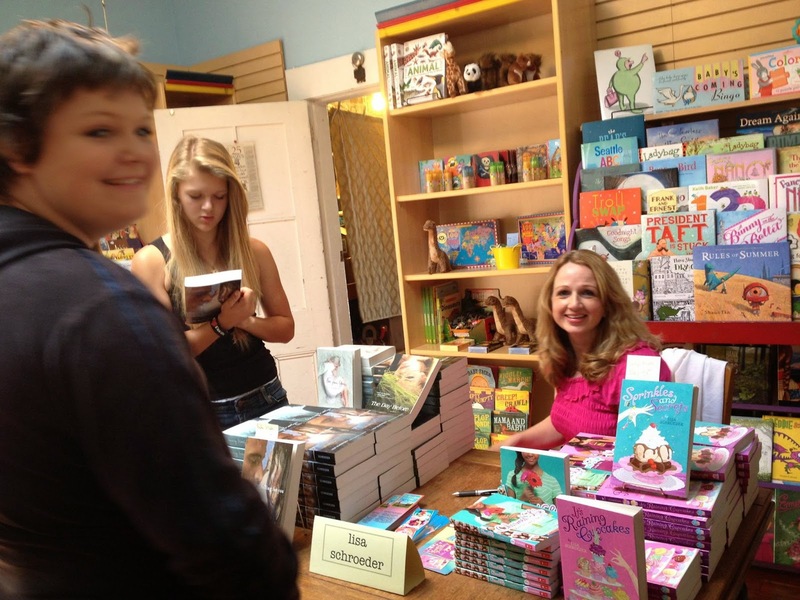 Although teens of all ages read my books, they've especially found a sweet spot with 7th and 8th graders. It can be a tough time for them, reading-wise, because they are over middle grade novels, but many of the YA novels have content that they may not be ready for. When I'm writing my YAs, I try to keep that 13-year-old in mind. Maybe, technically, I'm not supposed to do that. Maybe I'd be a lot more successful if I didn't do that. Maybe my career will be over soon because I'm doing it all wrong. 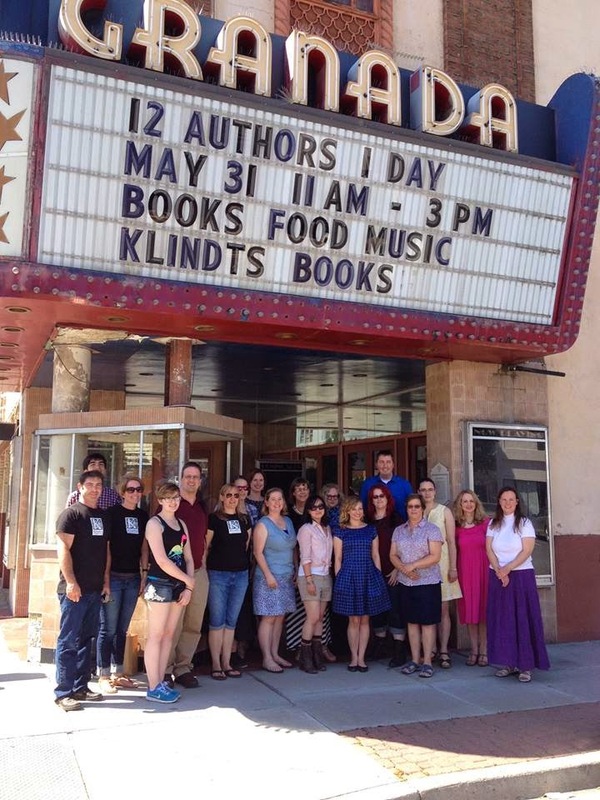 I did an event last weekend in the Dalles at Klindt's bookstore, the oldest bookstore in Oregon. Here are all of the authors along with some of the staff. And here I am at my table, talking with a couple of teens. When I walked up to my table, about ten minutes before the official start time for the event, there was a teen with her mom, standing there, waiting for me. I can't remember her name for sure. It started with an M. Mikayla maybe? Anyway, M. had two new books in hand, one of which she'd read but wanted her own, signed copy, and another she hadn't read yet. She said, "I should have brought my other books from home for you to sign." She paused and quietly said, "You're my favorite author." I may not be mentioned much on twitter by adults who read YA. I may not be the one people think of as an author who writes great YA for any age. I may not ever write a YA novel that sells enough copies, to adults and teens alike, to hit the NYT bestseller list. There is a lot I don't know, and even more I worry and wonder about when it comes to this sometimes-crazy business of writing YA novels. But I do know this. I love reading YA lit, and I love writing it too. And I am at least one teen's favorite author. I can't even express how honored I am by that.